It's like playing Clue: Prof. Magnus, in the laboratory, with the lead pipe. Professor Will Magnus invented the responsometer - a microcomputer capable of imbuing pure elements with a semblance of life, intelligence and emotion. Implanting samples of gold, iron, lead, tin and mercury with their own responsometers, Magnus watched the metals take on humanoid shape and personalities. The team of robots became the Metal Men. Lead is large and sluggish, with a huge heart and lovable nature. He is often used as a shield due to his natural properties against radiation. Lead may be a big loveable dope, but he's not a big loveable dope: he's short and squat, but this figure only gets half of that equation right. 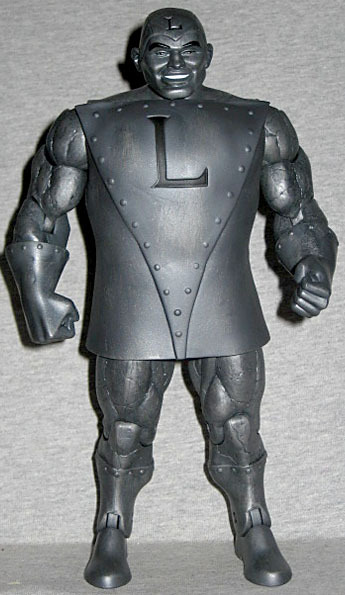 For whatever reason, Mattel chose to base this figure on the body of their Darkseid Build-A-Figure. In one way it makes sense, since that was such a wide figure, but it's still 8¼" tall when he should really have trouble breaking 6". He should be shorter than Gold, at least. If you ignore the size issues, the sculpt is a good one. 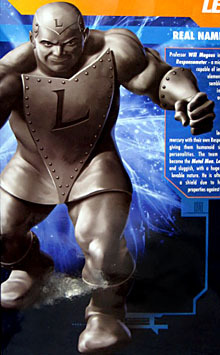 Like we said, Darkseid was a thicky, so Lead has an appropriate bulk to him. 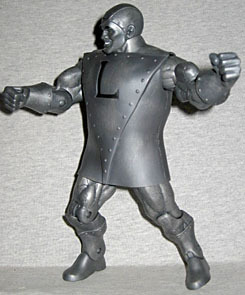 He's wearing a smock, like Iron did - Darkseid had a skirt, too, but this one is different. It's got a big triangle riveted on the chest, and new gloves and boots - also with rivets. The arms and legs have cracks around them, which used to represent stone, but now mean... the metal is fatigued? I don't know. As metals go, lead is very soft, so you'd expect it to bend before it cracks. The head looks great. It's proportional to the body, and has a big dopey grin on the face. The symbol on his chest and forehead is not the Saturnine ♄ symbol that's traditionally associated with lead, but rather a big plain L. Why? ♄ can't be any harder to draw than Mercury's thing. And even if it is, the chemical symbol for lead is Pb (from its latin name, plumbum), so why not use that? 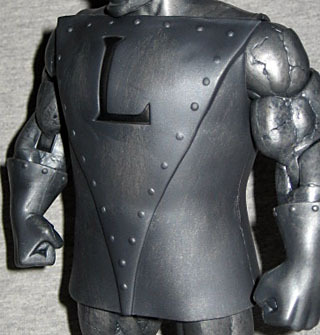 The Metal Men were allegedly created over the course of a single weekend, so maybe Lead was designed late on Sunday when everybody was getting lazy. Lead has a balljointed head, swivel/hinge shoulders, swivel biceps, hinged elbows, swivel gloves, hinged torso, swivel waist, swivel/hinge hips, swivel thighs, hinged knees and hinged ankles. The chest joint is rendered useless by his dress, sadly. He also fell apart at the waist when I took him out of the tray, but pushed back together just like the original BAF would have. Sadly, Lead gets no accessories: the previous three Metal Men have all had various shapeshifted hands, but Lead doesn't get a thing. Of course, he tended to turn into giant shields and things, so that may not have worked. The back of the box has the type of Mike Thompson art that just won the DC Signature Collection the "Best Packaging" title in this year's ToY Awards. 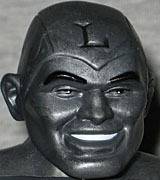 The portrait of Lead looks much like the toy of Lead: big, brutish and a force to be reckonned with. Of course, since this is just a digital painting and not a real, physical figure, there's no evidence to say that he's the wrong size here. Plus, there are no cracks in his limbs, so that's two in the art's favor. In the picture, Lead is striding forward, looking like he's bracing himself - possibly he's putting himself between the "camera" and someone he's protecting. Like this is the view from the scope of a laser rifle and Lead is taking the shots so someone else won't have to. Lead's translation to action figure form is not great. He's got the right proportions for the character, but he's too tall, has no accessories and the reused parts leave him with strange cracks on his surface. But he's necessary if you want to complete the Metal Men, and he's not so far off the mark that he'll look blatantly wrong in your collection.